Passport/Visa Rquirements: US citizens need only a valid passport. Rome is the Eternal City, one of the oldest in civilization, and an essential destination for anyone who loves food, art, or history. From the ruins of the ancient Empire, to the glories of the Italian Renaissance, to the tempting shops and trattorias of modern Rome, this city offers an endless variety of experiences. Artistic and architectural wonders abound – but for many, a stroll through the cobbled streets or an espresso in a famed piazza is just as memorable. 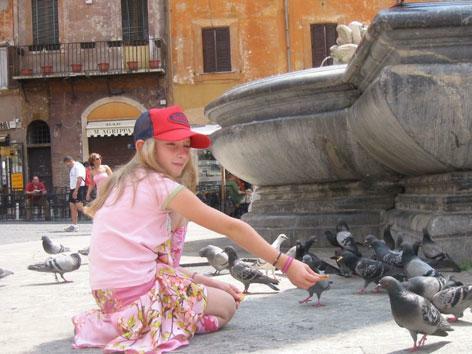 With so much to see, do, and learn about, Rome is ideal for families. My kids especially liked the fact that so many of the sights were outdoors. As fans of the movie "Gladiator," they were fascinated by the Colosseum, the Forum, and Palatine Hill. The catacombs made for a spooky and interesting history lesson. Villa Borghese, with its Bernini sculptures and expansive grounds, was a favorite, as was San Clemente, a medieval church with passageways to the city's layered past. And there's the fun of exploring Rome itself – shopping for soccer jerseys, meandering through the neighborhoods, and almost (but not quite) getting their fill of Roman pizza and gelato.